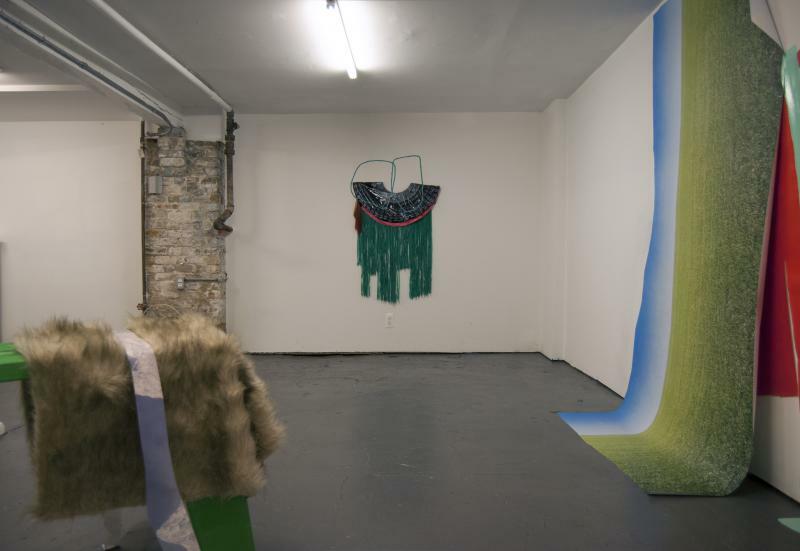 CHICAGO, IL 6/10/14 – THE SUB-MISSION is pleased to present We Tried That One Time, a site-specific installation by Megan Stroech. Stroech creates unfamiliar arrangements constructed from low-grade, accessible materials to challenge conventional understanding of their utility and erase associations relating to their traditional function. 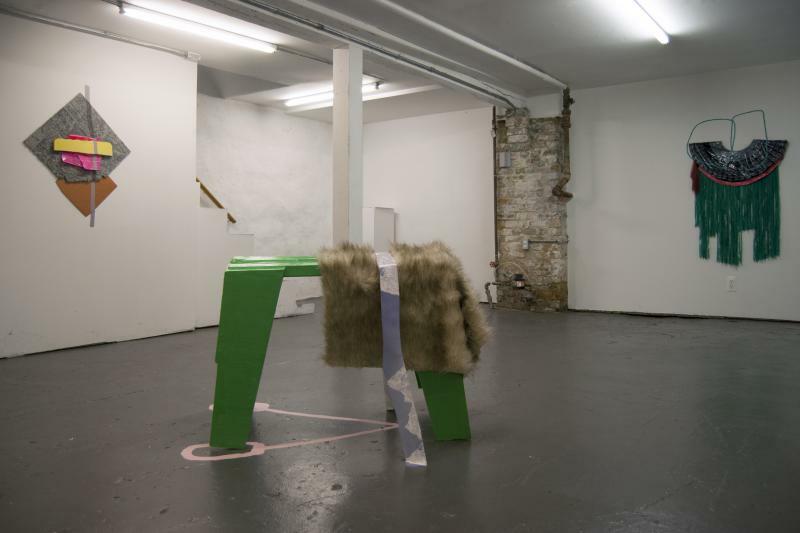 In her solo project in THE SUB-MISSION, she exposes specific architectural elements of the project space while obscuring others to explore perception, the relationship between object and space, and the common impulse to anthropomorphize non-representational shapes. 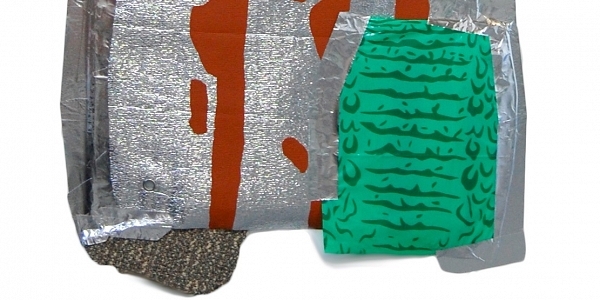 Integrating paint, fabric, Velcro, cardboard, and other found supplies into her works, Stroech reimagines and veils these source materials in her assemblages. She allows areas of paint to spill from the wall onto the floor, breeching the border and blurring the division between them. These flat areas of color interact with textured fabric, faux landscaping materials, printed scrapbooking papers, and mass-produced imagery involving pixelated sceneries. Stroech’s unconventional merging of the gallery walls with the floor of the project space requires the viewer to crouch down and interact intimately with the space to discover hidden details in the works while other elements of the installation encourage visitors to step back or stand tiptoed. Megan Stroech is a Chicago-based artist working in painting and printmaking. She earned her BFA in Studio Art from the University of Texas at Austin in 2008 and her MFA in Printmaking from Illinois State University in 2012. 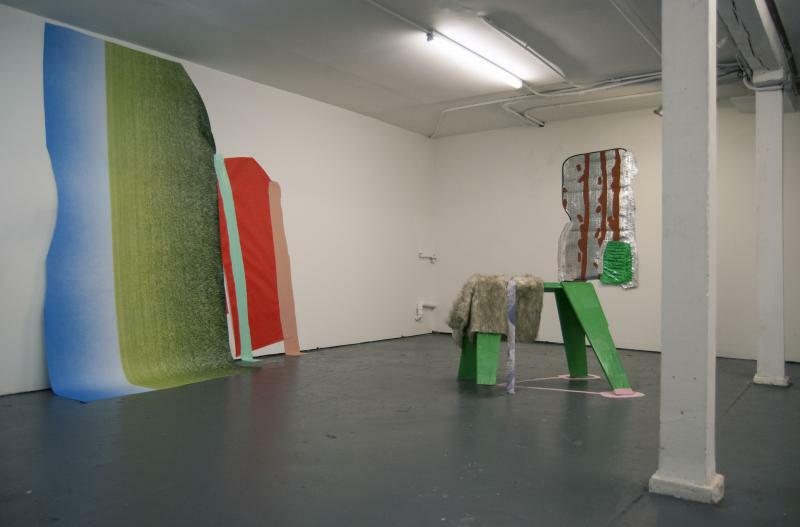 She completed a residency at the Anderson Ranch Arts Center (Snowmass Villiage, CO) in 2012 and was a Fall 2013-14 HATCH Projects Resident at the Chicago Artists Coalition. Stroech was recently featured in the Midwest Issue of New American Paintings (#101). She is currently a teaching artist at Spudnik Press and a Printmaking Shop Technician at Columbia College Chicago.